Delamanid is the active substance in a new TB drug treatment. Formerly called OPC-67683 it is also known by its trade name of Deltyba. It is the first in a new class of TB drugs called nitroimidazoles. It is currently being developed by the Otsuka pharmaceutical company as a treatment for MDR TB. Delamanid is given to adults with TB that is affecting the lungs, and which is multi drug resistant. This means that it is resistant to at least isoniazid and rifampicin, two standard anti-tb drugs. It is used together with other standard medicines, and it must not be taken on its own. It is used when other drug combinations cannot be used either because the TB bacteria are resistant to the other drugs or because of the side effects of these other drugs. It is available as 50mg tablets and the recommended dose is two tablets taken twice a day with food. It needs to be taken for six months. The main results of clinical trials come from a phase III trial and a phase IIB trial together with studies of safety and efficacy. This trial compared a background regimen plus delamanid to the same background regimen plus a placebo. Some initial results from this trial became available in October 2017. Among patients who received a background regimen plus 100 mg twice daily, 45.4% had culture conversion at two months as compared with 29.6% of patients who received background plus placebo. Patients who took part in two earlier studies were also then able to take part in a 24 month observational study designed to look at treatment outcomes. This observational study found that favourable outcomes were observed in about three quarters of the patients who received delamanid for more than six months. This compared to about half of the patients who received delamanid for less than two months. 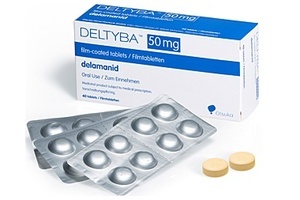 The Otsuka company has also started a phase three trial of Delamanid. The trial which started in September 2011, is designed to show if the drug is both safe and effective when given as TB drug treatment over a six month period. The completion date for the first tests of effectiveness was August 2013. In July 2015 data was published on the effectiveness of the drug for the treatment of XDR TB. This was a further analysis of the earlier phase IIB study. XDR TB is defined by the World Health Organisation as strains of TB that are resistant to the drugs isoniazid and rifampicin. They must also be resistant to at least one drug in the fluoroquinolone group as well as another second line injectable drug. Patients with XDR-TB who received delamanid in addition to a WHO recommended optimised background regimen (OBR), had a higher proportion of patients who had culture conversion at 2 months. This was when compared with patients receiving placebo plus OBR alone. As a result the patients who took delamanid had a greater likelihood of a successful treatment outcome. www.ema.europa.eu This means that more evidence is needed about the drug, and Otsuka is required to provide this. The company that markets Deltyba is to carry out further studies to confirm the long term effectiveness and safety of Deltyba. In July 2014 delamanid was also approved by the Japanese regulatory authority. In October 2014 the World Health Organisation (WHO) released its interim policy guidance for the use of the drug in the treatment of MDR-TB. Otsuka, the manufacturer of has announced a “FighTBack Initiative”. This is a plan to provide the drug for 20% of all diagnosed and treated MDR-TB patients, in quality management programmes by 2020. Before the results of the Phase 3 trial were known, there had been calls for Otsuka to make delamanid more quickly widely available.